First is One Who Killed, But Did Not Kill Another …"
Akorithi was born in 3E 369. It is not known when she wed Camaron, but the couple's first child, Arthago, was born in 3E 385, and Aubk-i a year later. Arthago was a sickly child and more interested in scholarly pursuits than being a warrior, and these things apparently embarrassed his parents. Akorithi's third child was born in 3E 392, and named Greklith ("Strong King" in the old Redguard tongue) and a year later her youngest, Lhotun ("Second Boy"). Arthago disappeared in 3E 400; it was rumored he died of a fever or was kidnapped by the Underking. In truth, Akorithi and Camaron had him kidnapped and left to die in a forgotten dungeon. In 3E 402, the War of Betony broke out between Sentinel and Daggerfall, over the namesake island. 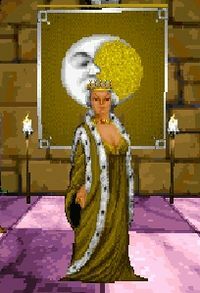 The deciding battle was fought at Cryngaine Field in 3E 403; both King Camaron and King Lysandus of Daggerfall were slain before Daggerfall emerged victorious, leaving Akorithi to rule and rebuild the kingdom. In life, King Lysandus had been loyal to the Empire, so when his spirit began haunting the streets of Daggerfall, Emperor Uriel Septim VII sent an agent of the Blades to investigate. These investigations led all across the Iliac Bay, and after doing a job for Prince Lhotun, the Agent gained the attention of Queen Akorithi. The queen hired the agent to sneak into Castle Wayrest and recover a magical painting that had once belonged to Lysandus. The agent also became involved when Lord K'avar attempted a coup de main against Akorithi's rule and it’s aftermath, though it is unclear how events played out. More importantly, after putting Lysandus' spirit to rest the agent recovered an artifact of great power, the Totem of Tiber Septim—the key to controlling the ancient Dwemer weapon, Numidium. A furious bidding war ensued as the major factions of the Iliac Bay region tried to gain possession of the Totem. Sentinel was no exception, and Akorithi offered the agent "a king's ransom" in exchange; upon receipt of the Totem, Akorithi promised to use its might to keep the "rebellious powers", Daggerfall and Wayrest, in check. After the agent journeyed to Aetherius to recover the Mantella, Numidium was ready. On the 9th of Frostfall, 3E 417, Queen Akorithi activated Numidium in the service of Sentinel. However, the impossible occurred that day; six other powers also simultaneously gained possession of the Totem and activated Numidium. In what became known as the Warp in the West, three days merged into one as the seven powers did battle. In the end, each Numidium was gone, Sentinel had greatly expanded its borders, and was at peace with the other surviving kingdoms (Daggerfall, Wayrest, and the newly-formed Orsinium) and the Empire. At some point in the following ten years, a plague claimed the life of Prince Greklith, and soon after, Queen Akorithi. She was succeeded by her youngest son, Lhotun. For game-specific information, see the Daggerfall article on Akorithi. 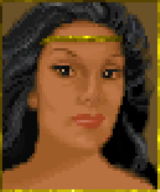 The name of Akorithi's eldest child is randomized in Daggerfall but is given as "Arthago" in Night Falls on Sentinel.